So, this is the BIG DAY in the U.S.A., the total eclipse of the sun! It will happen in just a couple of hours from the time I am writing, and I am really excited. Supposedly, it hasn’t happened in quite this degree since 1918, well before my time, of course. We prepared a couple of weeks ago, buying special glasses at Lowe’s so we could be ready for the event. And even though some clouds and the possibility of rain was predicted a few days ago, it appears the sky might just be crystal clear here. As I reflect on the coming solar phenomenon this afternoon I am reminded that blocking the sun is not such an uncommon thing; human beings have done it for untold years, of course. With shade trees, umbrellas, sunglasses, sunblock for the skin, etc. The difference with THIS sunblock today is that we are not in control of it! For approximately 2 and 1/2 minutes the moon will block the sun, and if you are in the right spot darkness will come in mid day. Sounds almost Biblical, doesn’t it? I plan to video the fade into darkness with my iPhone while looking at the sun itself as it appears to vanish. I’ve heard it’s an eerie and unnerving experience. Unforgettable! We use the word “eclipse” all the time, of course, usually in a metaphorical way, describing when some event is overshadowed by another, when a thing that previously drew our attention succumbs to a new phenomenon that upstages that which preceded it. Right now in our country we are wrangling over racial issues that threaten to divide our nation, or at least the media tells us we are in danger of division; sometimes it’s hard to tell what is really going on in this age of instant news. Morality, right and wrong, and social sensitivity are the hot topics of the day, woven together with politics and the economy. We have been introduced to the idea of “fake news,” not a truly new phenomenon, but one that seems more apropos to our nation now more than ever before. Occlusion, blockage of the truth, obfuscation; these are the things that alarm us now. We’ve suspected for a few decades that we were being misled from “on high” about a number of important social issues, but now we feel certain that the information we get from television, internet, radio, etc. is tainted with agenda and deception. Monuments, flags, place names, and other symbols of our nation’s past are now in question, and the attempt to destroy or remove these objects must run the gambit from the face of Stone Mountain in Georgia all the way to Mount Rushmore in South Dakota, from New Orleans in Louisiana to Savannah, Georgia and beyond. But for between two and three minutes this afternoon EDT we will pause in the midst of all this turmoil and uncertainty, look up into the sky, and marvel at the majesty and incomparable celestial display right in our backyard. It’s as if Barnum and Bailey have come to your house and set up the Big Top tent right where you live. But again . . . it is a phenomenon outside of our control. We couldn’t even control the threat of clouds blocking our sight of this event. We are completely and finally just observers and witnesses of the event. As for me . . . I expect to take those 180 seconds of time today and allow myself to be awed, lifted for a brief time out of the conundrum of current social ills fed by the lack of moral principle in our country, and immersed in the awesomeness and grandeur of our solar system (and our universe) which is present and active each moment we take a breath, not just in this brief eclipse event. In so doing I may be reminded of the fact that human beings, no matter their color or nation of origin, are important to their Creator and important to me. We realize we are all tiny beings when we encounter true awesomeness. And that insight will come as I look up, as I broaden my scope of vision, as I am made right-sized by seeing the total eclipse of the sun. And perhaps . . . if I can learn to live from this broader perspective, this macro framework, maybe I can better measure the things that are smaller. 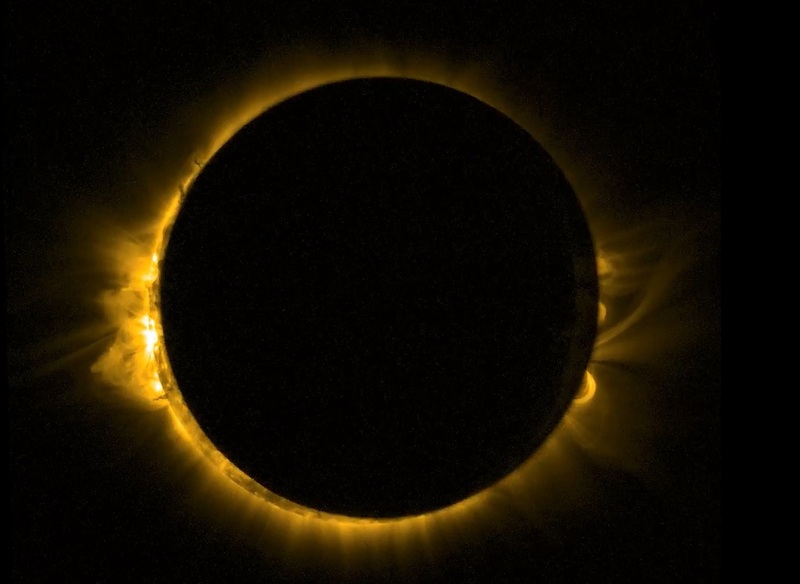 If the sun were to stay eclipsed, remain overshadowed, we would truly experience disaster. But when it emerges again this afternoon, and shines its light on us, we would do well to soak in its rays of insight and reflect its warmth around the world. This entry was posted in Uncategorized and tagged 1918, agenda, awe, awed, Barnum and Bailey, Biblical, Big Top tent, blockage, deception, disaster, eclipse, economy, fake news, flags, iPhone, Louisiana, Lowe's, media, monuments, morality, Mount Rushmore, New Orleans, new phenomenon, obfuscation, observers, occlusion, outside our control, overshadowed, phenomena, politics, racial issues, Savannah, Stone Mountain, sunblock, Total eclipse of the sun, witnesses. Bookmark the permalink. Made me cry – thank you for the important reminders in this!